When Betsy heard that Chicken Adobo won the poll last week, she was pumped. Of course, she was pumped because she thought it was a Tex-Mex dish! I then had to break her heart and tell her that while the dish shares a name with the sauce that chipotles are stored in (Adobo), it’s actually a Thai dish. Fortunately, this happens to be an amazingly delicious Thai Filipino dish so there were no hard feelings. Chicken Adobo is a delicious traditional Filipino dish that is made by simmering seared chicken pieces in a rich and flavorful coconut milk broth! 1) If you’re using a whole chicken, slice off the thigh/leg and the breast pieces. Leave the skin on. You can also use all thighs or any assortment of chicken pieces with the skin on. 2) Toss chicken with braggs and soy sauce to marinate for 30 minutes. 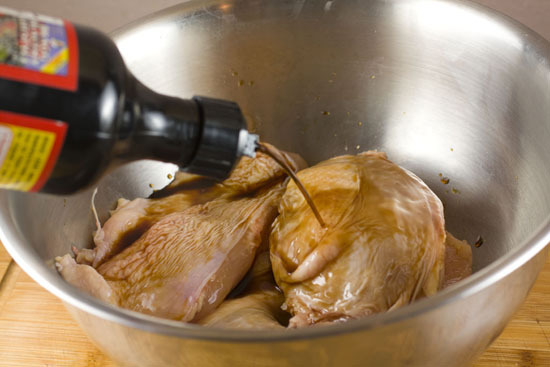 3) Remove chicken from marinade and let any excess drip back into bowl. 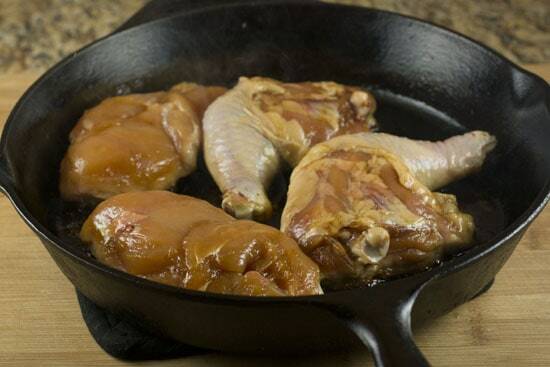 Transfer chicken to non-stick skillet (cast iron skillet) over high heat, skin-side down. Cook for 8 minutes until chicken is seared well and the skin is crispy. 4) Meanwhile, whisk coconut milk, vinegar, garlic, and spices in with soy sauce left from marinade. 5) When chicken is done, transfer to a plate (it will still be uncooked on one side). Pour out any fat from chicken. Add chicken back to pan, skin-side DOWN. 6) Pour coconut milk mixture over chicken. Bring to a simmer and turn heat down to medium. Simmer, uncovered for 20 minutes. 7) Flip chicken skin-side UP and cook for another 15 minutes in the sauce. 8) Transfer chicken to a platter and cover loosely with foil. 9) Remove bay leaves and lime leaves from simmering sauce and skim off any fat pools. Simmer and reduce for 5 minutes and then pour sauce over chicken. 10) Garnish with scallions and serve with rice. There are two keys to making this Chicken Adobo dish really delicious. First, you have to use chicken with the skin on, preferably bone-in as well. That boneless, skinless stuff just won’t fly. The most economical way to do this is just to buy a whole chicken and then butcher it into the breast pieces and leg pieces. This is the video I always point people to if they need help cutting up a chicken. Of course, you could buy pieces that are already cut, but just make sure they have the skin on and bone in. 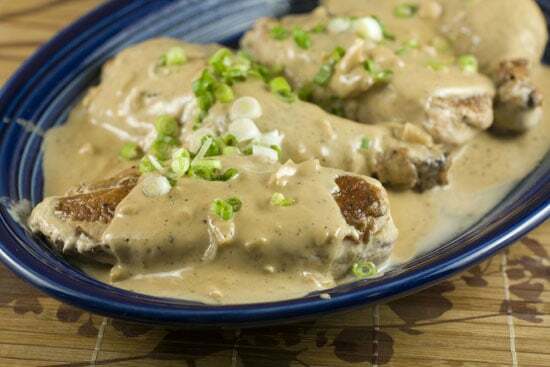 Second, you want to marinate the chicken in Braggs and soy sauce which will make it very savory and delicious. You only need to marinate it for about 30 minutes because the flavors are pretty strong. If you don’t have Braggs, you can just use all soy sauce which is actually what the original recipe used. This sauce is super-simple to bring together. 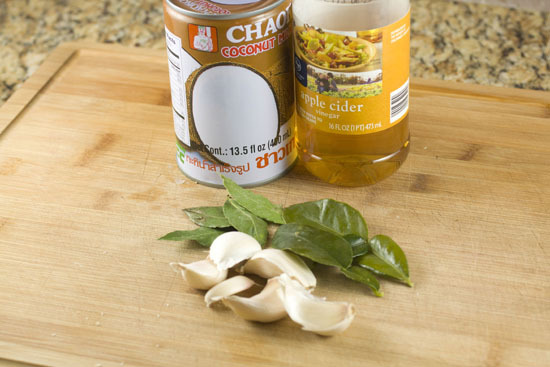 It has a base of coconut milk, but the real flavor comes from lots of garlic, pepper, and apple cider vinegar. After the chicken has marinated, remove it from the soy sauce mixture and then whisk in the coconut milk, vinegar, chopped garlic, bay leaves and lots of pepper. If you don’t have lime leaves, just don’t worry about them. I just threw them in because I had some left over from my charred eggplant curry. 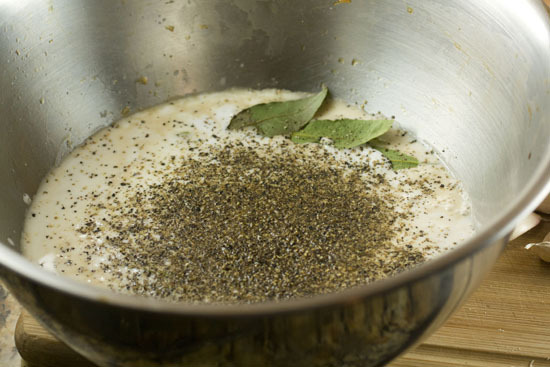 Now normally, you wouldn’t want to mix sauce ingredients into a chicken marinade for food safety reasons, but in this case we are going to simmer this sauce for over thirty minutes, so it will be totally safe. 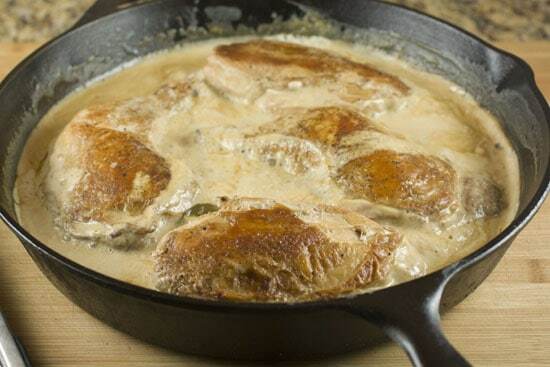 The key to making this dish work is to get a really nice sear on the chicken skin and then simmering the chicken in the coconut milk sauce until the chicken is cooked. The original recipe calls for a nonstick pan, but I prefer my cast iron skillet when I’m cooking high-heat stuff, so I used that. It worked great. Just make sure your skillet is seasoned well or give it a light coat of oil before adding the chicken. 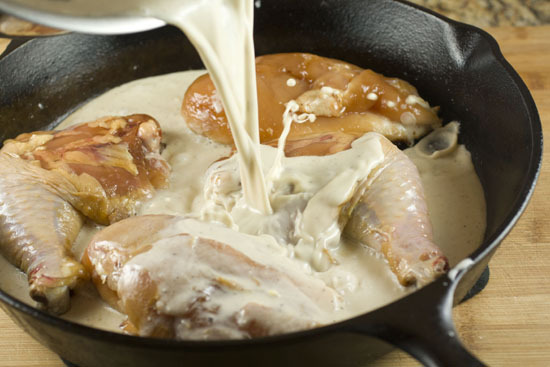 Add your chicken to your pan over high heat with the skin-side down. Cook this for about 8 minutes without touching it! A hot pan is key. A lot of the fat in the skin will render out as it cooks and the skin on that side will get super crispy. Then just pull the pieces out. Assuming your pan is correctly seasoned (or oiled lightly) the chicken shouldn’t stick at all. This was my seared chicken after 8 minutes. Keep in mind that the chicken is still basically raw on the other side. You could never get this kind of sear with skinless chicken. At this point you’ll probably have a small amount of fat in your pan. Pour this out. You don’t want a lot of fat in your final dish (besides all the coconut milk). Then add the chicken back to the pan, skin side down still, and then pour all your sauce over the chicken! Bring this all to a simmer and simmer it for about 20 minutes. Next, flip the chicken so it’s skin-side UP, and then simmer it for another 15 minutes. That should be more than enough time to cook the chicken through, but you might want to check a piece just to make sure. To finish off the sauce, take the chicken out and lay the pieces on a plate and cover them loosely with foil so it stays warm. Then remove the lime leaves and bay leaves from the sauce and bring it to a simmer to reduce for about 5 minutes. Then just pour the sauce over the chicken and garnish everything with scallions. Just serve this Chicken Adobo with some basmati or jasmin rice and you’ll be in for a serious treat. 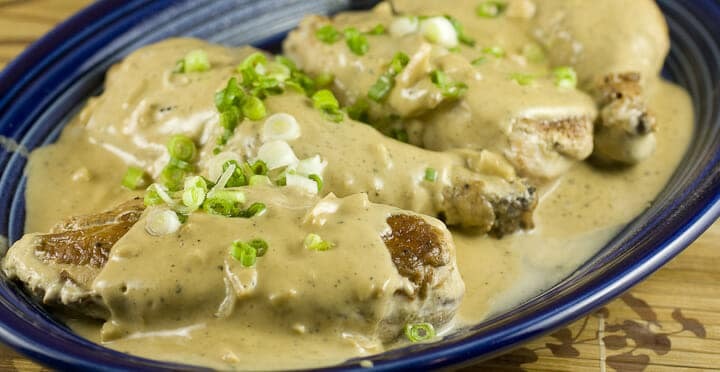 The chicken stays really moist and flavorful and the sauce is this perfect mix of rich and also tangy. It’s not spicy at all though so if you are a heat fiend, keep a bottle of hot sauce close! Where’s the avocado? hehe, Cute! When I first came across this dish a couple years ago on the internet, the only thing that made me click on it, is because I thought it was Tex Mex as well!! Actually Tex-Mex, while wrong, is closer than Thai. Adobo is Latin American originally and has become almost the national food of the Philippines. Ah yes… Philippine.. not thai. Thanks for the correction! Oh so this is supposed to be a Filipino adobo? Weird, I’ve never seen one with a coconut milk base and I’ve eaten a lot of different adobos in the Philippines. EIther way – it’s a fun variation and my original comment still stands lol, I’ll have to go this a shot! This looks amazing. Times like this I really wish my husband wasn’t on weight watchers! I bet you could lighten it up by using light coconut milk and doing bone in but skinless , or diced boneless skinless chicken breasts tossed in a touch of cornstarch to get it slightly crisp to still get the flavor of the dish, then save the full recipe for a night when he wants to use some of his flex points. Serve over some rice or some steamed veggies. I’m doing weight watchers too and that’s what my plan is. Thanks, Emily–that’s a great idea! The WW thing is killing me–I generally cook healthy but not THIS healthy. Plus I’m a marathon runner who doesn’t need to go anywhere near a diet and since I don’t want to cook different things and we’re all eating the same meals I’m ravenous and unfortunately losing weight right along with him. Nice dish. I am going to use ponzu for a more Japanese twist! Just made this dish Nick – and it is pretty spot on. The only comment I can give is there seems to be no sweetness component? Most Fillipinos I know use palm sugar – I garted about 2 tablespoons into the sauce in reduction, and that balanced the flavors out a bit. Hey Nick – This is definitely a very different take on what I know to be adobo. Now I am not Filipino myself, but I have grown up in a navy town with a strong percentage of Filipinos who serve – so I have been more than lucky to get my share of Adobo and Pancit (great accompaniment for Adobo!). I am not use to having coconut milk in it, lol. I will definitely have to give your version a try, as I have a friend who is Samoan and seems yo use coconut milk in near everything she makes! hehe She would get a kick out of me making the adobo like this, as I always tease her about how much coconut milk she uses! I would have to agree with the posting from Jason – as I prefer to use a touch of brown sugar (as I do not have palm sugar easily on hand, heh) because I find that it does help to balance the vinegar and round out the saltiness of the soy. I too also like to use ponzu as the citrus notes are there – though traditionally sometimes lemon juice is used in place of some or all of the vinegar. I have never tried liquid aminos before, but have been seeing them more in recipe searches I have done this year. I must give them a try too – though soy sauce really is a staple of my pantry. Thank you as always, Nick, for taking your time to share with us some great recipes or ideas. I hope that you did not mind too much my 2 cents (or was it 3? lol). THanks for the comment Ben! yea.. a pinch of sugar might not be a bad idea. I’ll definitely try that if I make it again. As for the coconut milk, that was just Cook’s Illustrated suggestion… it worked great so I’ll stick with it even if it isn’t 100% authentic. An ingredient I see here is Bragg’s. We don’t have that in Brazil, I have no idea what it is. How could I replace it? Never mind, I just saw you can replace it with soy sauce. hey Nick, this looks absolutely amazing, but I want to ask you if I could substitute the coconut milk for cow’s milk boiled with some coconut shavings. I suppose the dish will lose some coconut flavour, but coconut milk is not very popular here. You can make coconut milk!! …if you can get your hands on a coconut. Just throw the chunks of coconut in a blender with some water. Blend it up and then squeeze out the pulp as much you can and set it aside. The leftover liquid is coconut milk. If you make it too thin (too much water), you can just simmer it longer. It’s like a Filipino chicken fricase, love it. 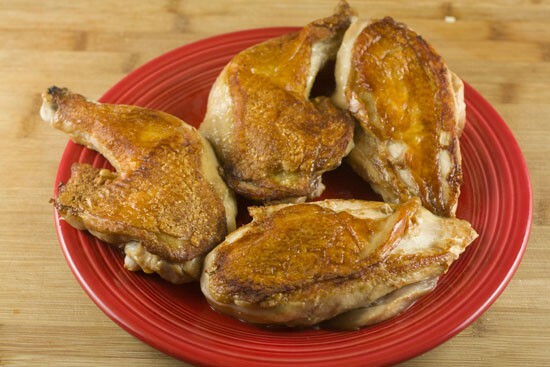 Nick – this looks tasty and I have a whole chicken that I cut into parts and have to use in the next few days. My only concern is whether the chicken gets tough from being cooked so hot on one side for so long. My chicken is a locally grown chicken that has a stronger texture than commercial chickens anyway (since it actually used its legs and wings!). I don’t want to make it tough by how I cook it. Sure Amy. There’s almost no chance that it will be tough, but because your bird is probably a bit smaller, I would reduce the cooking time by a few minutes. Should work great! Had to check back. I made this tonight and it was A-MAZE-ING!!! I used light coconut milk and rice vinegar (I can’t stand apple cider vinegar) and reduced the cooking time just a bit as you suggested because it was a small bird (~ 3 lbs). I just happened upon some kaffir lime leaves while I was out today and am SO glad I did. I’ve never cooked with them before, but they added a really fabulous, distinctive flavor to the dish. I’ll be using them again every chance I get. Thanks for the great recipe, this will be a keeper! This is Filipino adobo, but is more like adobo you will eat in the Visayas where coconut milk is more often used in cooking. this is not what most Filipinos would call adobo, but this a regional version of adobo. the national version has no coconut milk in it. there’s this book called The Adobo Book which tried to capture many different versions from different parts of the country and strangely aport from vinegar there is no other single ingredient that ties up all the different versions. some people may call this “white adobo or adobong puti” but that usually refers to adobo that uses vinegar only as a base with no soy souce in it. what in the world is Braggs? « Ski Day Potato Soup Recipes Home » The Internet Kitchen: Busted!